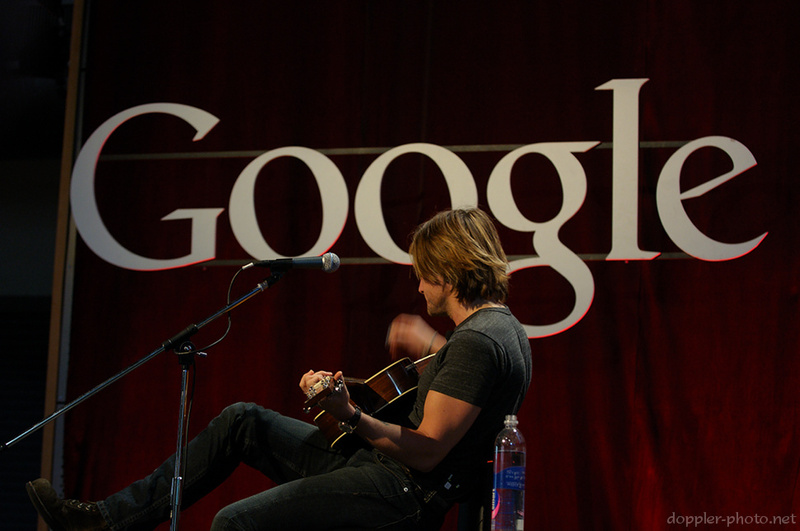 While on tour for the release of his new album "Get Closer," three-time Grammy winner Keith Urban made a quick stop at the Googleplex. Above, he sings the lyric "I love this girl!" 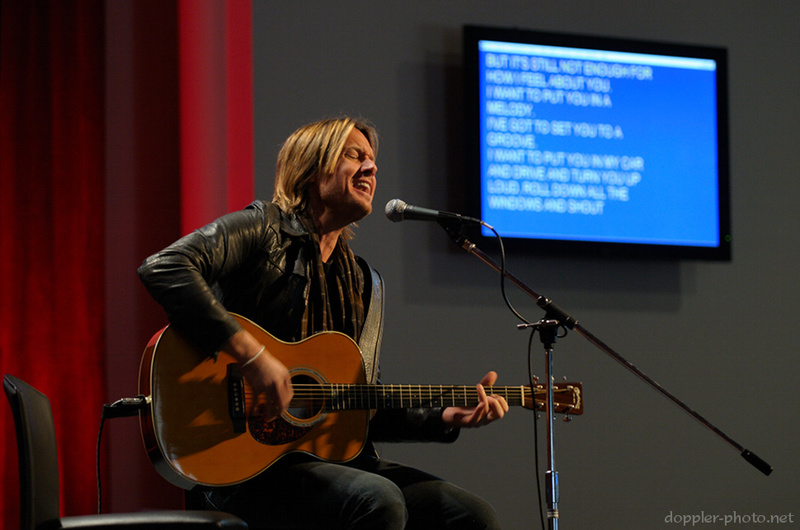 during his performance of the album's opening track, "Put You In A Song." Urban mentioned that he had originally written this song about the proverbial unattainable girl, as a way to keep her with you when she's in your thoughts. "Wrap you up in a melody so you'll be stuck in my head all day / 'Cause you're already there anyway" he sings. Overall, the show was a unique opportunity to learn about Urban's music as well as his personality. The concert alternated between songs and Q&A, during which Urban took us through some of his experiences in being a professional musician, and also explained some of the motivations behind his songs. 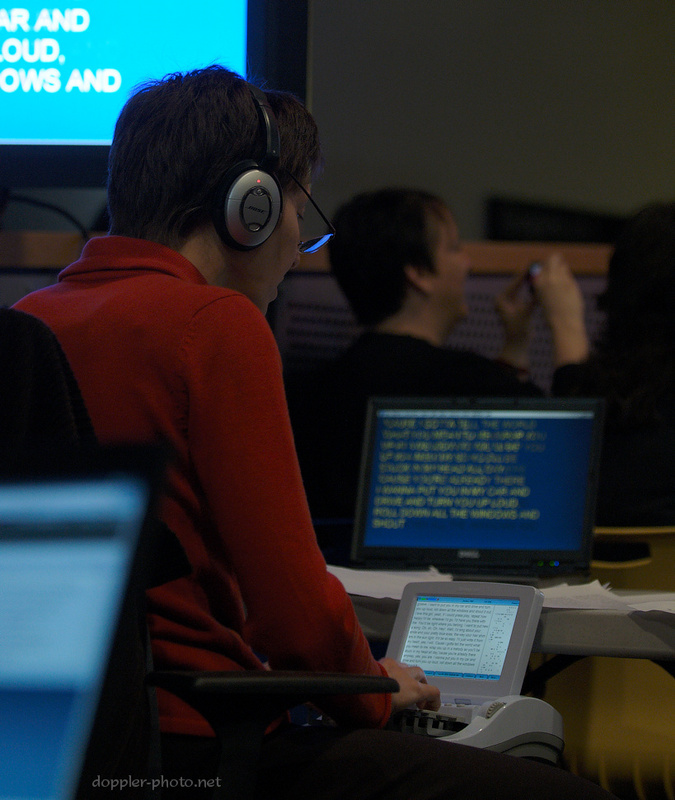 Google has a fantastic stenographer who transcribes nearly everything that's asked, spoken, or sung in Charlie's, Google's main "auditorium." Here, she follows along with the lyrics for "Put You In A Song" as Urban sings them. For people who can hear, it provides a second opportunity to catch a lyric, a question, or an answer that one might have missed, and for people who are hard of hearing, it provides a way to follow the concert in time with the rest of the audience. During this concert, it was an especially valuable service since people often asked questions that were pertinent to the songs that had come immediately before. A short line forms behind a microphone during one of the Q&A interludes. Members of the audience (both in Charlie's and watching over VC) asked a variety of questions, including what it's like living in Nashville, how Urban chooses which groups to play with during concerts and tours, and how he achieves a work/life balance. I was struck by his response to the work/life balance question. First, he acknowledged that the work/life balance doesn't just happen, but rather it's something that one has to actively work to maintain. Urban emphasized that when you're drifting too far to one side, you have to realize that and be willing to make changes. He also mentioned that in his own life, he tries to organize his tours so that he's not away from home for more than three days at a time. The response was an interesting contrast to the concert two years ago where Jimmy Buffett's daughter Savannah Jane responded to a question about what life was like with a traveling dad (see here). It'd be interesting to hear what Urban's daughter, Sunday, thinks thirty years down the line. A Googler asked a two-part question which evoked laughs from Urban and his interviewer, but which also served to highlight Urban's sense of humor and improvisational skills. First, the person asked whether Urban would be giving away a guitar during that show. Urban had a chuckle before flatly responding "no," after which he quickly explained to the audience that some time back, he had started a tradition of giving a way a guitar during each concert while on tour. The Googler then explained that his sister was very hard to shop for, and that if Urban had been planning on giving away a guitar, it would be nice if he could have given it to her. 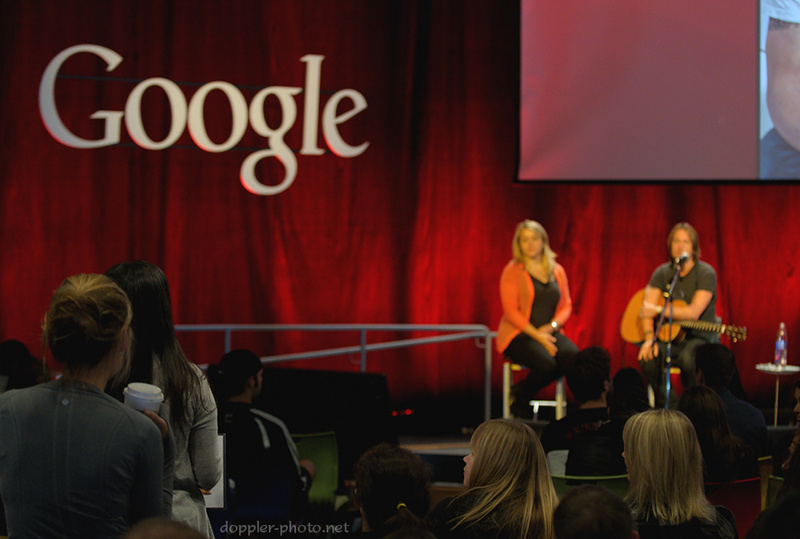 He further explained that his sister was actually also a Googler, and was in the audience. After a round of laughter, Urban asked for his sister's name ("Sarah") and had a quick chat with her before he went on to play the last song of the show. The last song was going well when all of a sudden Urban mentioned the name "Sarah." I was slightly confused, and I saw the people around me look at each other in the same "wait, wait, was that part of the song?" manner. 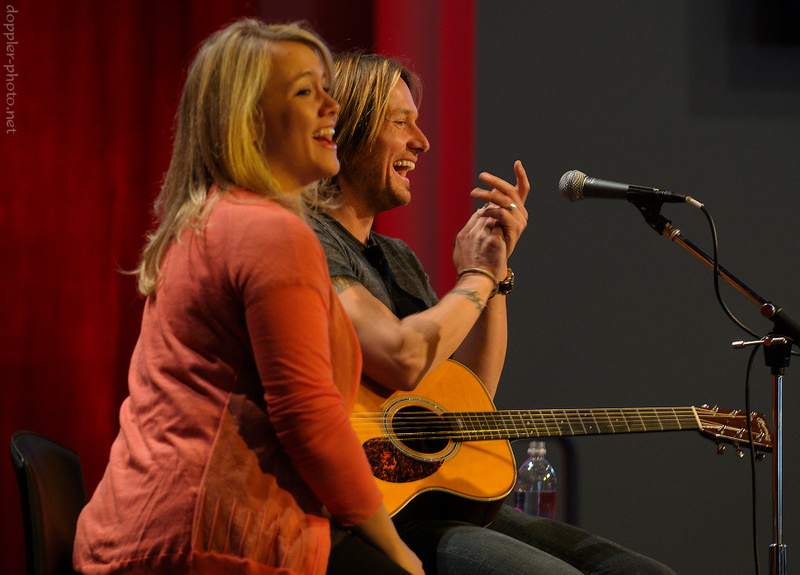 As we did, he started singing a verse about how, if he were going to give away a guitar, he'd definitely give it to Sarah, at which point we all had another bout of laughter. Urban finished the song with a flourish, thanked the audience, and left the stage.